Ed’s breaststroke is very very consistent. He does not rush his stroke, he rides his stroke very well. He gets everything out of his kick. When his timing is [ on ], he’s absolutely perfection. What I see in Ed is being so conscious about technique, every little detail of the stroke. And obviously he’s got a great talent. I do a lot of filming of athletes. And I travel around a lot of clubs in the country. There’s no other breaststroker I used to demonstrate skill under water than him. I mean Ed is probably one of the best athletes [starts to ?] 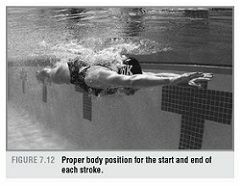 swim breaststroke to get his body aligned up exactly right. I don’t know how many national team athletes are put on the screen along with Ed and [sceen? script ?]. Of course, history shows us he was the first man to [recommed and realize with ?] and help us to swim the gold medal and break world record. Most world record holders looked back on a long history of competition after reaching the [　？　] reserved for the best of the best, not at Moses. Favoring golf clubs and the soccer ball, Ed carried the swim through only 3 months of the year until his senior year in high school . Ed went from season lastly to fifteenth in the world in the 100-meter breaststroke. The year was 1998 and the ride hasn’t stopped. [Ed has aggressive and thorough preparation to find him both in and out of the water]. His constant push to perfection brings passion to his preparation. the learning curve of his sport is what makes him a true champion. Breaststroke, according to Moses, is an in-depth [ ? ] Ed Moses, the person, and the process that is his gold medal winning form. Q : You gave up swimming at ten years old, took up golf, took up soccer, not exactly the normal path to becoming the world’s best. Can you say there are some things that you picked up in your other sports that helped you to become world [rare]? I think it was just an overall athleticism that I had. When I stopped swimming, I did other sports and I did them well, you know. I participate, like you said, in basketball, baseball, soccer. It was just that drive that I had to be the best in whatever I’m doing to win. I didn’t know what that was, but it was a combination of hating to lose and wanting to win that at all costs. Q : How do you [account] for such a quick entry into year-round training and then going all the way to a professional level so quickly? I think that’s the past that come from within. Again, we were talking about the process of how every day you are gonna have to do what’s right to make you better. That’s a multi-dimensional task in the sense that when I stand on the block I’m racing or competing. I believe that the only way I’m gonna be at my best is that when I’m standing there. whether my sleeping habit, flexibility, strength, or rollback capacity, everything. I’m confident that I’ve done more than any other person has done. And that goes along with training. I don’t show up in a ten practice because I’m supposed to be there. I’m looking at ways to make myself better. always [taking] in the next step, by never thinking that you are doing everything. Q : Relate golf to fast swimming. Well, golf is a mental game just like swimming. Often time you find yourself you are out there alone, and takes a lot of focus and all a lot of distractions. But one thing you need to be able to do is to have your goal in mind and how you are gonna get there. When you start from the Tee to [ ], there is a process. Starting from 30th in the world to get to the top of the world, there’s a process. I want to follow that, and to follow that is a mental challenge. There’s science I believe behind it. I’m not saying there’s a technique for everyone, but here’s a technique for each person. And that’s what I’m trying to do is find what technique is best for me. So I’m constantly changing and playing with my stroke to find out how I’m gonna get from A to B, the fastest in least amount of energy. And that what I think directly relates to my ultimate performance. So my technique is gonna be different from the next person’s, but again, we are looking what worked perfectly for me. And that’s what I’m trying to get there. Incredibly advanced, especially in swimming from video analysis to swimsuit technology. I don’t think you can claim that swimming is advanced due to technology, but it’s the body excitement to the sport. It’s something that kind of keeps you pushing. You always look to technology and science to make you better. I think that has to be part of the process. I think technology is for a huge [ ] in swimming. Hip hop, R&B, [stuff like that], gets me going to accomplish what I want. Anything that just gets that blood going to make me wanna pursue these daily goals. Q : Tell me about tattoos. They all have meaning to me. And one thing is that a tattoo is a permanent. I want something in my life that is gonna be there forever and they represent things that I think till the day I die are important to me and what I believe is a person. So they are a big part to me. This one says I will do whatever my coach tells me to do. That’s my favorite personally. I can almost get into a cross position with my body flat on the water and my arms at 180 degrees. And my next instant is when I go for my insweep that my upper body and legs are gonna follow a path over that point. your legs and arms are just along for the ride. And they're just part of the stroke. because this is obviously my fastest position in the stroke. and then immediately get into that long line position. So each time I wanna replicate that. as it would look in the beginning of the race compare to the end of the race. and I am just moving my body throuth those anchors. 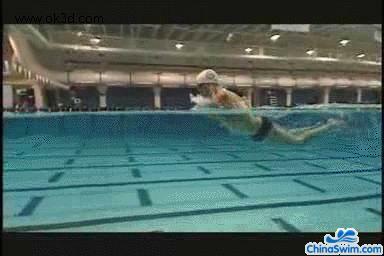 and I want to do that at least drag efficiency, I want to pull out my body through the water and use the central part of my body as a strong effect ( aspect ?). Breathing has to be thought about, otherwise it becomes forced. You won't take your breath until you really realize you need it. By that time you've gone into action that's probably too late. The important thing, I think of breathing, is that you don't create your breathing pattern with your head. You have an opportunity to breathe every stroke and that can be created by moving your head back and forth to get out of water. You have to maintain the back of the neck, the back and the knee line. So when I think of breathing I am gonna be coming out over the water. then returning back to that long line position that we're talking about. So there is no head movement bobbing up and down to get air. Because, again, that's gonna cause my hips to sink behind. For every action and reaction, when I lift my head, my hips are gonna sink. We're getting back to that foul ? position. So ideally we are keeping that line together that we're always looking for. I like to repeat myself : kick your hands forward. allowing my kick to push me over top of that anchoring position and returning that long line position. get over my hands with my kick, and continue to do that in the full range of motion : start and finish the race. and to have the maximum amount of ankle catch possible. any position that we can get and that would mimic that, even push beyond what my normal kick would be. I think translate it to the water. through all these drills that force that issue, so I can remember it and become the second nature to me when I swim full breaststroke. The kicking aspect of breaststroke is the most important aspect. That is where you are gonna maintain the long line with a lot power behind you. The stronger you kick, the longer you are gonna be able to stay that position. The anchoring of the kick, to me, would make sense that you want to force water backwards. There is a mistake with a lot of breaststrokers in their kick. They think that breaststroke is a squeeze pattern that you are gonna drop you knees out and you are gonna squeeze the water together behind you. because all your force will be in the opposite direction. That is an aspect that I think, I've developed and applied to my stroke, which has allow me to stay that long line position. 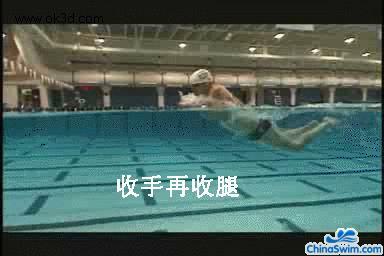 The unique part about the breaststroke kick is ... it's the combination of flexibility and the combination of strength. You will not have successful breaststroke kick if you have one without the other. I think both of them are needed. To achieve this, you have to have maximal ankle flexibility for a good catch and good knee flexion to maintain the range of motions. With the combination of those to our goal is to have maximal flexion, maximal ankle catch, and the force backwards that's directly perpendicular to the stroke. And what that's gonna allow is a huge force forward, allowing your body to continue moving forward in that line, rather than up and down. When I am kicking, and I am kicking at my best. My philosophy is that I am trying to force my ankle faster than my feet; so what that will allow would be maximal ankle flexion. it would slow down the outside of my feet and allow my heels to move faster than the outside of my feet. 过江龙a + 5 + 50 + 5 很给力! 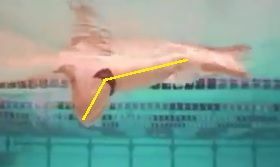 To emphasize the anchor and the streamline position. Some of the drills you might do would be underwater swimming, maybe three pulls and a kick. That will be done with a straight body line, there will be no fluctuation of frequency. That line will stay straight. A lot of that can be created by underwater swimming breaststroke. 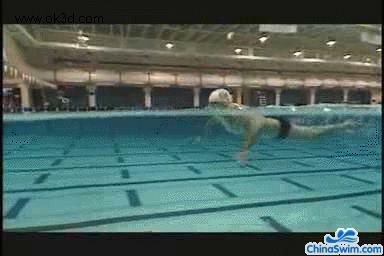 And this is gonns replicate what I think helps me become a world class swimmer, and maintaining that line. you're laying on the water or your hands behind you. you are almost weightless that you could just do one motion and your body can just maintain that velocity of that one motion forever. That's the variation, the hands leading the body, but very effortless and weightless out front. Not moving, but just extending the core line and making it experience the balance position with his arms way out front. We will repeat that with a pulse pull. So you will do that and you'll take a pull of breaststroke and maintain that body position for [ extending other ] time. To know what it feels like to have that long position and to have long distance per stroke, and a good glide. obviously the resistance is gonna be a lot higher than swimming almost like a dolphin through the water. and will stay in a streamline long position a lot longer. what I try to maintain that line while pulling and kicking. The visual effect we are creating is that would be able to move along through the water with minimal drag rather than forcing our way through the water. the [ polo ] kick allows him just warm up his ankle flexion, one leg of ankle all the time. Breaststroke is always be deemed a feel stroke, your breaststroke is gonna be [ fast ] when you feel like you are swimming and your technique is together. 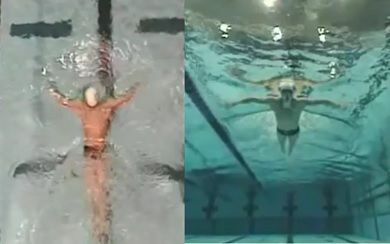 And these drills are done to replicate that feel of balance and positioning on the water that suit your body the best. 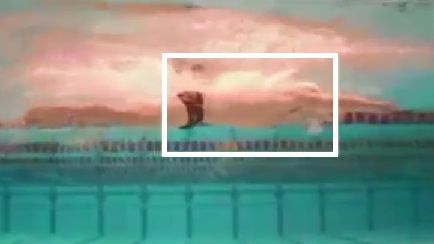 like to get the kick completely under water, so you feel the recovery through the finish of the kick. concentrate harder on your line position, cause it puts an artificial float so you got to presses his back position even [ more ]. Take the next step with your line, our first process is gonna be through your arms. arms that anchoring position where you move your body over the anchor. We are gonna emphasize that a lot by doing a lot of sculling, many different sculling position, sculling where on your back, on your stomach, feet first. That's done by slowing your stroke down and feeling your corner especially. A lot of people do sculling drill but don't really know what they are doing in the process. We are trying to maintain here to recondition where your hands are in the water and where they would be during the stroke. So we are doing lots of sculling, your feet forward, your feet behind you, position instead. You won't only recognize where your hands would be, but it's awareness of the width you pull and the strength of your anchor. So when you would go to swim after that, will easily make more recognizable what quadrint of the water your hand easy be end and location your body. One of our sculling drii is one arm at time, just working corner anchoring and feel. It's maintaining its core balance forward position. So he has to balance to get a great feel for it. it's the same sense that you're gonna be holding on through the water, and moving your body beyond that hold position. that everything that I'm doing with my kick relates to the forward speed. Some of these drills are going to be wall-kick. What that does allows extra pressure to be put against my ankles to force them in thrie flex position. Verticle kick,the same way with it. Maybe you weight something to force you down again to stress the ankle position. and that's gonna keep that line long and increase your distance per stroke. There is one philosophy: that's fastest and [furtherest]. As soon as you come up that block,it got be pure explosion. We're gonna get in, we're gonna get in that long line. We have a powerful pull-out, and we're gonna come up further and faster. That's the goal. I think the start is pretty indvidualized. I think you have to feel comfortable up there. First thing first, you got to feel like you belong up there. As soon as that gun's off, all your energy can go directly into the water. The technique of the turn is to reach the ultimate point which is to get on the wall and off the wall the fastest. touching with both hands and immediately dropping one elbow and driving the knees up to the wall. And therefore that's done, a perfect turn can be executed with a strong push-off in a long line. Again, we're talking about that long line, the least amount of resistance is gonna get you further on every pull-out. Emphasizing the amount of time spent in this position is a huge part of the race and a lot of people don't realize that. All work of my pull-out and turns is to the point where I can come up within half a yard or about point one or point two of a second. That's a repetition that I practice, so when the race comes along I can simulate this in an easy manner. This eliminating point one or point two of your turn is gonna get you a faster time. That's something without even working. You're gonna have to do it. It's easy time that you should emphasize perfection on the walls. (Hero is) someone that I think portrays me. Again, along the line of the similarity is Steve Prefontaine . Something Prefontaine had was that ability to just love and have a passion for a sport, and be willing to do anything that he possibly could to become his best. He ate, breathed, everything was around his running, you know. He was always trying to find a way to be better. And I think that’s what I am trying to do in the same sense, you know. is to have such a passion that you are always looking for an answer as what can make you better. Q : What is it that was so unique or so [ ? ] about your racing technique that you now emphasize in [putting] to practice on the routine basis? and that I had a natural ability when competition was [on line]. And I had to pursue that in practice if I was gonna better. And what that was was my ability to use my strength and size for a powerful stroke [ ? ] in distance per stroke. And that was done through maximizing my line. And when I’m saying my line, I’m saying that I wanna be in a least resistance position as possible when I’m swimming. So I wanna use my pull and kick and perfect a technique that allowed me to be in that long line the most amount of time. be able to mirror image what I was doing in competitions for a longer period of time in training. And that would relate to me becoming a better breaststroker. Q : So how you bring freshness to work that has so much repetition? Short term challenges, that’s the only way you can. you gotta [ sit? ] on Monday and say tonight’s practice I want to do this. If I don’t do this, that’s not gonna allow me to do what I wanna do on Saturday. Come Tuesday, you gotta repeat the process. To get a look at each day as a new day and a new challenge. I don’t look at it as a big picture, because again, not many people can swim and stare a black line for 5 hours. It’s a draining process, but you have to find little tasks each day that excite the athlete. training and certainly to those performances possible? Well, the mental side, like you said, is just as demanding as the physical side. I feel like, you know, when I come to practice, that’s almost the easy part that any physical [demanding … giving me my best]. But, there are mental aspects that involve sacrifice and effort, and [whether gone] in your life. You cannot just go out there and work hard every day. There are ups and downs with everything. and realize that there are other things in life that are just as important to you, you’ll have a peace of mind and continue on with that [ ? ]. Q : Tell me once again who is your favorite face to see at 4:30 in the morning? My favorite face to see at 4:30 in the morning is at the back of my eye. I don’t get up that early first of all. An import aspect of cross training swimming with dryland is that you maintain the integrity of your stroke. A lot of the work I do here would be emphasizing, particularly in paralleling what I do in the water. We want work that is specific and directly towards what we want. what we are trying to achieve in the water, I think we have increased performance. ankle flexion, maintain in the core line, anything that I think is gonna overload the body. So when I swim breaststroke, it’s gonna feel like I’m floating. Toys that I use are just gonna reinforce our philosophy in breaststroke with the kick and the pull. They are just gonna put resistance in the motion that we are trying to stress. So it’s an overload. Stress cord attached to a bucket. They obviously made this one look easy by putting some holes in the bottom. If I’m stressing them to a higher range of degree than I would when I’m swimming, my body would adjust to that. It feels like that range is being adapted into my stroke. Probably one of my favorite ones is the stretch cord. This’s gonna attach to my waist, and you could imagine, [ tightened ] pretty much a leash. anything to feel my line lower more than normal. when I do swim the breaststroke, they feel natural and strong to me the same time. [ is as long as it makes me tired we are using it ]. 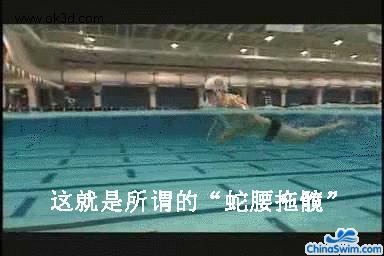 to create more resistance when he kicked in breaststroke. What I saw in that was similar to what you see with any type of [ ? ]. You put a resistance somewhere where you wanted. You stressed that resistance and then you built up strength to it. Ed tailored the cut to the contour of his ankle. I readjusted the holdings, sawed it down, put some pull design on it to make it unique to myself, and the thing worked. 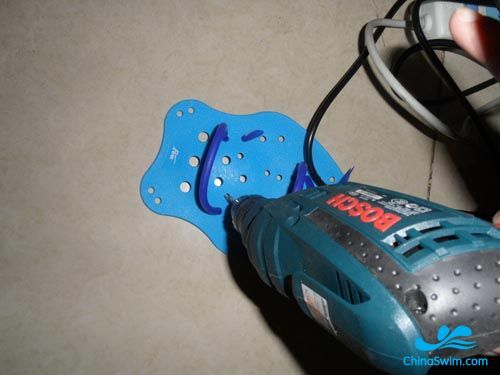 Now with the better [ fit ] and positioning new holes for extra [ fingertubes ] , you’re gonna have more refined engineer kick paddle for breaststrokers. What we are trying to is have a full flexion with a pushback and a close. This paddle allowed that. And that was a huge step, I think, to developing my kick. is resistance against the ankles and the kick to develop strength in your kick. First time we used it to [ kick ] back and said that the tension coming off the heel didn’t create pressure the way he liked to feel the kick. So when you went to kick, the tension was coming from the ankle point that really wasn’t relevant to your kick. It was just more relevant to an extension. You can get that same force by going to the weight room. So we reengineered it so that the point of tension was coming from the outside of the foot. 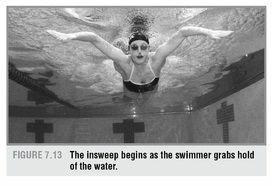 and you [will] have to pull against it, it would [flexure] foot out in a proper breaststroke position. You can’t go into a weight room and reproduce the kick like you can in the water. So we want to put the resistance in the same fashion that the kick is and these toys are allowing us to do that. The paddles are allowing us to do that. that allows for when I take this off, I’m gonna feel exactly like what you would feel swimming with paddles when you take it off. And you have a good catch and you are maximizing your range of motion. [　?　] ever beat you in challenges on those toys? I don’t like that happen. There’s no way. There’s a combination ways of putting this catch, this anchoring [over] hands, and this direct kick with your pull. Cause it's gonna allow for the fastest and strongest position I have in my entire stroke. regardless of the effort, regardless of the speed, and it's there, day in, day out. And I acknowledge it, you kown I don't just let it happen. I'm not just going through the motion to get it, I understand what I'm doing. but the crucial part is the timing between your pull and your kick. I wanna kick my hands forward, and get into the streamline, long line position more time than anybody else. I wanna anchor and kick my body forward ,over that anchor to allow for maximum distance per stroke. Two things we are gonna look at here is line position and the leg draw. We're gonna pause right here and show you that from end to end. We're looking at the straight line, that's the core line that we have been talking about. You want to be as tight as you can be, and as long as you can be, cause we're maximizing the straight there. The next important thing we're gonna analyse is the knee flexion and ankle flexion, right there. That's what we're looking at, the angle right there, the knee flexion. We're trying to maximize the knee flexion to have a huge range in our kick. It's allowing about 15 degrees of flexion there, and there our ankle are gonna flap out as much as we can. This's gonna allow for the greatest amount of water that'll be moved. Now you proceed a little fuether, what we're gonna watch is my ankle, right there. See how the ankle is totally been flexed out, it's perpendicular to to the leg. At that point, we're catching the most water. And we are gonna follow through into the full kick, and return exactly that position we talk about, the straight line position. After the kick, we are gonna lead it to the pull, which is gonna be our anchoring position, we got a straight line, I show here. And the next thing we're gonna do is gonna wanna anchor the arms and point away from the body. So the point here is to hold as much water as you can at these anchor points,　and pull the core through these anchors. Just like what I say, we're gonna pull, imagine you have a ring and you're grabbing it, and pulling the core line through. Going to anchor as wide as I can, that's a feel. And my next step that I'm going through in my head is I'm going to pull my body over my hands by holding the water. So this point right now, I'm holding the water, concentrating on keeping my line, holding my head over my hands, so I can breath. And the next step is gettint the hands out away, and I'm thinking about maximum flexion of my knees immediately after. After that step, ankle flexion, right now I am think about pushing back as much water as I can while maintaining the straight line through my core. That's gonna be the fast position that I can be . I am gonna finish the full kick, that's my goal, and return back to the straight line, and start all over again, next step through my head again. Anchor, I am gonna push widely my hands, holding the water, keeping my head in line. And then again, back to the step, I am gonna be kicking my head over top of this anchor, and then returning to that fast position. Head over hands, straight line, kicking the hands forward. That's what going through my head while I'm swimming. Most of your weight is obviously in the core and you're gonna wanna bound your core to feel that your legs and arms are just along for the ride. And they're just part of the stroke. The sense that I'm going through when I'm swimming breaststroke is that I want to be as long and have the least non-drag as possible and I want to be as high on the surface as possible, because this is obviously my fast position in the stroke. GMT+8, 2019-4-26 11:44 , Processed in 0.086507 second(s), 38 queries , Gzip On.